There are a couple of new paintings that have been added to the group of work I have hanging in my studio. The two paintings could not be more different yet both have meaning and inspiration for me. 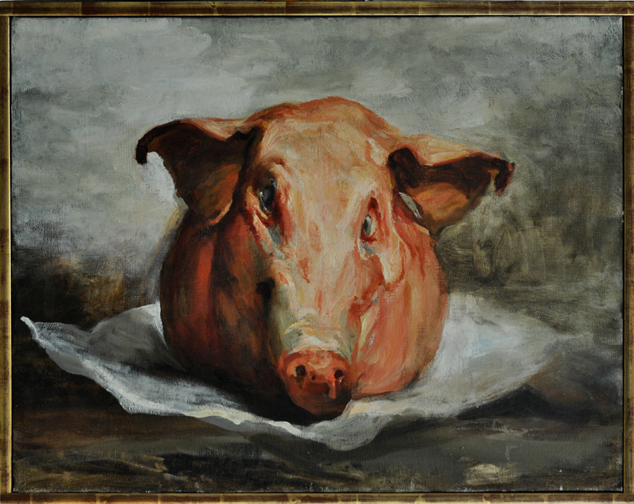 The first is the oil painting shown here, Pig’s Head from David Levine. The late Levine was the celebrated caricaturist whose work was a staple of Esquire Magazine, the New York Review of Books and other publications over his illustrious career. I wrote about him a few weeks back in a post about a caricature of Richard Wagner of his that also hangs in the studio. He was also an easel painter and watercolorist of great renown, particularly his works depicting Coney Island and its people. He was a really marvelous painter. This piece was obtained from the estate of the late Thomas Buechner, who was a friend as well as a colleague of Levine, having painted with him and curated exhibitions of his work. At first, I thought the piece was a bit macabre. I mean, it’s a pig’s head on butcher’s paper. But the more I looked at this painting the more I came to see it in terms of color and form, taking in the light and shadows and the contrasts of color. I see it as an expression of paint now and am constantly amazed by it when I turn to it from my painting table or desk. It has real presence on the wall and is a beautiful piece of painting. I am really proud to hang it with my work and find inspiration in it. The other painting that graces my studio is from an artist much less accomplished at this point in her young life. 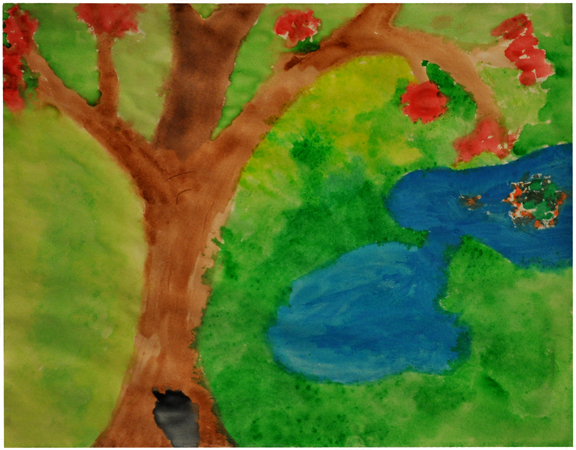 It is an interpretation of my Red Tree done by my friend Olivia from Illinois. Olivia is a nine year old whose father recently contacted me, telling me how much he and his daughter enjoyed my work online. I sent them a small print in appreciation and Olivia responded with the wonderful watercolor shown here. She also sent a thank you that included a drawn self-portrait that I really like a lot. Nice, strong lines. Confident. I can’t tell you how much this gesture from a young artist I may never meet means to me. Just knowing that she has found something in my work in which she finds inspiration of some sort is gratifying enough for me. So, there they are, two paintings done by two artists, one whose career is finished and another whose career, in whatever field she may someday choose, has yet to begin. One is immensely accomplished whose work graces museums and great collections, and the other just learning. Yet both hang side-by-side, both equally filling me with great inspiration and hope. I can’t thank David Levine but I can send out my thanks and best wishes to my friend Olivia.